Lori’s recent post on Women in Ministry had some good discussions going and helped expose us to the growing defense for women in church leadership. The egalitarians are now going verse by verse to wrest (pry, dislodge, yank, and remove) the scriptures to try to undermine the traditional Biblical theology that God intends male leadership in His church and in the marriage. There is this idea that some place, even if it takes years to build the framework for it, God never intended for women to be left out of teaching, preaching and leading the church forward. After all, there is no male or female in Christ for we are all brothers and sisters, sitting equally as joint heirs under the Lordship of one head, Christ Jesus. So how could God leave women out of church leadership? Now to me, an almost lifetime lover of the Lord Jesus and His Word, this seems a little harsh on the surface. The apostle Paul is not giving all the reasons why, just the most important ones: 1) Woman was deceived and 2) falls under the curse of the garden when God says, “He shall rule over you” (Gen. 3:16). Don’t shoot me for this because if I were God I would be far more lenient, yet I don’t recall any leniency given to man over the centuries for pulling weeds and providing by the sweat of his brow. The weeds and hurricanes don’t stop, animals still attack each other and the results of sin continues to prevail. All of the curses of the fall remain in place to this day, including pain in childbirth, and yet some want us to believe when God says, “He shall rule over you” (Gen. 3:16), that this proclamation is to disappear in these latter days. Let me make it clear that what I am referring to is the way the church and family are structured in God’s design. Outside of the church, and those who do not adhere to the Christian faith, they are a law unto themselves and will create any norms, mores and culture that they desire. If we someday have a law that only women can be leaders in the work place I will joyfully follow my woman manger as I have in the past, and give her all the respect and hard work that I can possibly give. She may well be more talented and gifted, or a better leader than I am, and her position of authority over me is one to be honored, but only outside the family and the Church. What we are talking about here is how God throughout the ages has structured the family and His religious orders. Note that even if one could completely wipe out all the passages in the New Testament concerning male leadership, you would still have to answer why the Old Testament model has 99.9% male leaders. Sure, go ahead and talk to me about Deborah and a couple other exceptions, and let me remind you that not a one of them was a religious leader. God never said women could not be teachers or leaders, but God gives to the godly men the role of leading His Church! Neither Christ, nor the disciples, nor the apostles ever appointed or advocated female church leadership in God’s Word. Furthermore, wives are given a specific role to focus on the nurture of their husband and children. Let’s get real here a second. I don’t buy into any of the dishonesty of the supposed scholars who have somehow in these latter times found that the Greek text does not mean what all the other scholars before them found it to mean. We’ve had multiple people tell Lori that the commentators she uses are outdated and she should not be using any of them that are before the discovery and translation of the Dead Sea Scrolls. Well guess what! The Dead Sea Scrolls contain just fragments of many of the OT Books, and none have conclusively been shown to be a piece of an NT book. And it may surprise you to learn that the DSSs actually support all of the major doctrines of the Bible. Ironically, one women founded her lack of trust in a post Lori was writing based on her husband who is completing seminary telling her that the DSSs disprove what she was writing about the Proverbs 31 woman. The Dead Sea Scrolls do not even contain Proverbs 31. The big push is to see the Greek word authentein as meaning domineering, instead of exercise authority over. Go ahead and change the word in the text and it would read: “But I do not allow a woman to teach or be domineering over a man, but to remain quiet.” How is this silent woman who is not to teach men supposed to lead in the church? Or do the words teach and remain silent also have some new interpretation found in ancient manuscripts that God has chosen to hide until now in the age of feminism? Satan is the master of confusing things and what we are finding is a whole church and churches full of people grasping at straws to try and disprove male leadership in the church. So long as they can throw one small underpinning after another, no matter how spurious it may be, the whole must add up to something… right? Proving that God is not denying women Church leadership is still not proving He desires women in leadership. There is not one passage that is specific to women asking them to lead in the church. And how can they meet the qualification of “the husband of one wife” to be an elder or deacon? “It would have never occurred to him (Paul) to add shame to shame by dismantling the structure of the household… What Paul obviously did not do was to demolish the structures and create new ones. What was radical lay in urging those who are filled with the Spirit to have totally transformed relationships within the household.” Cultural Context of Ephesians 5:18-33. In Dr. Fee we find a New Testament scholar who knows that none of the interpretive gymnastics that the egalitarians want to try will work when it comes to wiping out the plain teaching of the text. He clearly understands that the intention of the apostles and early church was to forbid Christian women in authority over a man in the home or in the church. I urge my brothers and sisters in Christ to adopt his honesty concerning the plain reading of the text, and if you still must try to advocate for female leaders/teachers in the church, grab a hold of Dr. Fee’s paint brush of “cultural.” It’s an honest position, even if we believe it to be completely wrong and does violence to the continuity of God’s Word. Dr. Fee, how do you know that God did not intend His Word to transcend culture as it has done for 2000 years? If you believe that some structure must exist in the home and the church, as you do, give me your basis for knowledge that God intends the new structures of our culture to be based on gifting, personalities and how we relate to each other? 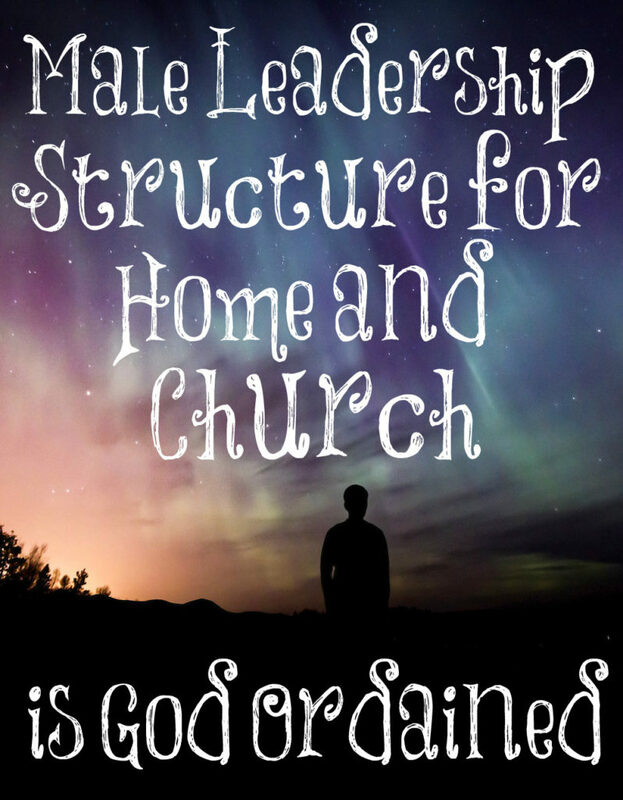 If the male leadership structure is not what God intends for all homes and the church, why didn’t he give us a hint of such a thing coming during the time of Jesus, or in the early church, or in His Word? Instead he gives the opposite, and God is not the author of confusion or guesswork. Our theology is certainly not to be based on a conjecture of “cultural.” And many understand this dilemma. Hence the impossible search to try and find a basis for women leadership in the Word. Do you realize that counter-culture Jesus had every opportunity to close this debate by appointing one or two women as His disciples? That God could have closed this issue by having Peter or Paul appoint a couple female elders? Yet now you want us to believe that after all the Church age of male leadership in the church, you have discovered that male leadership is not critical to advancing the kingdom of God on the basis of conjecture alone… no proof from God’s Word. If God leaves such an important issue related to life and godliness open to cultural changes, when do we start accepting homosexual marriages in the church? Is polygamy next as it is far more defensible from the Word than female leadership? The door to the slippery slope is now wide open to all who want to see “culture” as dominant over the clear teaching of the Word. There are a hundred questions I would like to ask those in Dr. Fee’s camp, but in the end we will reach an impasse because I firmly believe that God’s inerrant Word transcends time in this matter, and that no better model of leadership can exist than to have a godly Christian husband leading his home along with a plurality of men as elders leading the church. And this is not conjecture, but based on God’s perfect Word. Our God is very clear on what He wants from mankind and His church, and to leave such an important issue completely unsupported by His Word has to make the unbiased student side with traditional theology on this matter. God indeed wants Christ to be head of all, and husband to be head of his wife and family, and male elders in charge of His Church… just as His Word plainly says it. Can a Wife Disobey Her Husband if He Asks Her to Get a Job? As a former pastor (Lori knows my story) I know and have lived first hand and seen why God doesn’t allow women to be pastors. After 4 years, I realized how wrong it was because of the negative effects it had on my children and my family. I was very capable to do it, good at it and enjoyed it but it became evident it was wrong. And I think Half of the women that I know that are pastors get confused because they have the talents to do the job therefore they feel God called them to do it even though that is not the case. And the other half of the women pastors I know are very feminist, don’t have kids and have no problem being itinerant and living away from their husbands because they don’t value marriage and family very highly. Just because you are capable and have the gifts to do something doesn’t mean it isn’t harmful or that it was what God intended is what I learned from my experience. The best ministry for a woman to have is in her home serving her husband and children. I find an interesting analogy with the Levites who God chose to be priests in the Old Testament. Many from Judah and Benjamin and the other tribes must have thought themselves just as talented or spiritual, perhaps more spiritual during the real rough years of sinful service of the priesthood, yet they knew that God had called only men to Temple and even more restrictive, only the Levite men. Who are we to question God’s choices, although we most often can see his reasonings behind them. As in your case, a wife and Mom can’t fully pastor and take care of her first responsibilities well, no matter how talented or energetic she is. Awesome post, Ken. Thanks for sharing. Why would women be allowed in leadership roles when there wasn’t any value on their lives besides being property. There are countless other scriptures to back this up. If we take the Bible 100% literally then men would be able to have as many wives as they want and sleep with anyone. When Jesus came he abolished all of the laws that man had created in the old testimate because they weren’t ordained by god. He said that because man couldn’t follow the ten commandmence that god gave them he was going to simplify things by having them follow two; put god first, and love your neighbor as yourself. He said if you follow these two you will follow the others. With this being said women were still treated as property. You are correct for the Old Testament, and the Greek culture was not as limiting to women, but still women mainly fell under male leadership. It’s kind of a natural thing that has been broken by technology. We know that the culture of the times would have limited a woman’s role. You are incorrect that Jesus came to abolish the law, but instead he says, “Do not think that I have come to abolish the Law or the Prophets; I have not come to abolish them but to fulfill them. For I tell you truly, until heaven and earth pass away, not a single jot, not a stroke of a pen, will disappear from the Law until everything is accomplished.” (Matt. 5:17-18). But Paul, the same guy who teaches male leadership in the church, did his best to break away from Judaism and the law, showing us that we are free in Christ Jesus, but now under His Lordship. You are so right that the greatest focus must be on loving God and loving our neighbor. The most important way we love God is to obey Him at His Word and walk within the promises that He gives to us. It seems that you would be in the camp that believes that the many passages of scripture that are given related to male leadership of the home and church are “cultural” and should not apply to today. I understand the argument and have started that it is the only one that has any possible merit but the argument is full of holes. I won’t go through all the problems with the “cultural” position as I you can read them in the post. The two most important would be that you have no proof God only intended this doctrine to be cultural, but much proof that it is not. God does not say that the reason women are not teach or exercise authority over a man is cultural, but instead says that woman was deceived and appeals to the creation story. This story is far before culture was created when God says, “He shall rule over you.” Why does that pronouncement at the fall change now? When God through Paul is referring to it as the reason? The second major problem the cultural argument has is that even with Jesus wanting the church to be in new wine skins He doesn’t leave any hints in his ministry or in the NT that he wants women in Christian leadership. He tells us the opposite, and you want us to believe that based on your conjecture that God intended it to be “cultural” so it is cultural. Last I knew the Church never assumes a doctrine that is against what is taught in the NT based on an unprovable supposition. The only way to find out if you are right is to get to heaven and discover that God simply did not see fit to add one female disciple or elder that we know of in the NT church, better yet, 2-3 women church leaders to be certain that is what he wants. If God wanted this to be part of the new wine skins, why not start it with his church in Jerusalem and in Greece? Why keep such an important doctrine hidden to the conjectures of today when feminism is here full force? There are too many holes in the theory of “cultural” for those of us who hold a high view of God’s desire to communicate with clearly to think that we can just conjecture and assume our way to truth over what is plainly taught. What is the Biblical perspective on female choir leaders? I’m not talking about a woman leading congregational worship, only being in charge of and directing the coed adult choir which sings an anthem during worship service. I would appreciate your insights on this! My personal view is that women are welcome to participate in all of church life except for the narrow instruction for her not to teach a man, (and I believe this refers to scripture and theology, not how to sing), or exercise authority over a man in the church. So long as she is under the authority of elders and pastor, and avoids any issues of having to exercise authority, she is welcome to and encouraged to lead the choir. If she runs into an issue with a choir choir member who needs correction she hands the problem off to her leader. Ken, thank you for this post. Over what feels like many years, I’ve consistently returned to Loris blog, even though I continued to resist the teaching that was women should submit to their husbands and be at home. Yet I kept returning not because of Lori but because she consistently turned her focus to the word of God, which I believe to be infallible. I’ve seen changes in my marriage through my submission to my husband, which basically just looks like letting him lead and submitting my own will to his. This does not mean I don’t have guiding roles in our household through managing our finances, our meals, etc., but it does mean that I steward those things with the blessing of my husband. I do firmly believe, though, that women are also made in the image of God and it is our calling to bear the image of God in every area of life that should shape women’s hearts to follow God’s word and normative structures for their lives. I hope these beliefs are not somehow contradictory. My understanding is that it is sinful for a woman to preach, firstly because it is for men to lead which includes interpreting the word of God and secondly because it is a sin for women to hold authority over men. Added to that for a married woman is that her first duty is to her husband, children and home not to the wider world. Thank you for your post, Ken. In our church, only priests preach, and they are all men. In our home, my dear husband led our family while he was still alive. When he passed away, I had to lead my son while he was still a child. When my son became an adult, I allowed him to lead. My dear son later became a missionary and led a small group of missionaries in spreading the Gospel before he passed away. It’s sad to lose a husband and a son, but I am still grateful to God for blessing me daily. Blessings!